IT was an action packed weekend for the squad of Harlow Judo Club with players travelling up and down the country. 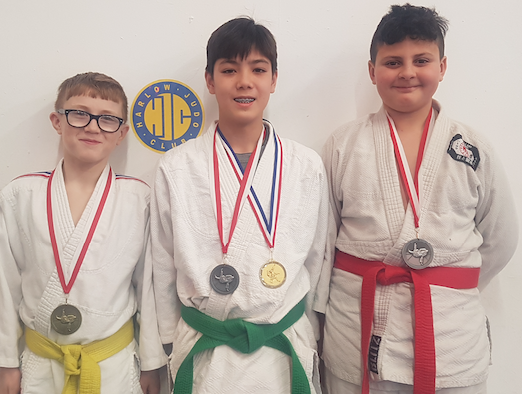 On Saturday, Owen Lambert (13) and Sam Cobbin-Brown (12) were Harlow Judo Club’s representatives who travelled to Walsall Campus, Walsall, to compete in the Midland Area Age Band Judo Championships – Pre-Cadet & Cadet Competition. As this was such a high level event, Clubs attended from afar as Wales, Northern Ireland, Scotland as well as all over England. First up was Owen competing in his weight group in the Pre-Cadet section where players are born in the years 2005-2006. He proved his ability by winning all 4 fights displaying not only fantastic tachi-waza (standing techniques) throughout his fights but also, but also where necessary, pinning his opponents down in ne-waza (ground work). He won the first 3 with straight Ippon (maximum score) and the final round with Waza-ari (5 points) which enabled him to take the Gold medal. Sam, also competing in the Pre-Cadet section, was up shortly after Owen and battled hard in his first round but unfortunately was outclassed. He won his second round with good ne-waza (ground work) holding his opponent down to claim a win and gave him a much needed boost going into his next fight. Unfortunately he lost his 3rd round and was knocked out of the competition. The standard of Judo was naturally high but then so was the level of Event. Sunday was a trip through wind, rain and sun, to Worthing Leisure Centre, Worthing. Today’s squad consisted of Sofia Kafas (11), Owen (13), Eli Balski (9) George Franks (12) and Ramy Mamouri (11). This was a lower level event split into 2 groups being group 1 – novice grade to 6th mon (red to yellow belt) and group 2 – 7th mon to 12th mon (orange and green belt). The team performed outstandingly with each player medaling in their respective weight groups. First up was Sofia in group 1. As an inexperienced competitor, she worked hard and listened to Coach Mick’s advice and claimed the team’s first Gold medal. Next up, also in group 1, was Eli. He fought hard winning all rounds with good tachi-waza and ne-waza techniques apart from the last fight meaning he had to settle with a Bronze medal. George won all his fights with ease displaying great techniques to take the Club’s 2nd Gold medal. Last up in the group was Ramy who like Sofia, is an inexperienced competitor. Despite trying very hard and close to giving in, he picked himself up but sadly was outclassed in his weight group and came away with a Silver medal. Last to represent the Club and in the Orange/Green belt section, was Owen. It was a big ask of him to compete today knowing that he had made a trip up to Walsall the day before, but as always, was up for the challenge. Sadly he lost his first fight but what followed in the subsequent rounds was breathtaking fast judo, outclassing his opponents to take a well deserved Silver medal. Head Coach Mick Ellis stated that it was a fantastic weekend for all his team and couldn’t ask for a better result from his players. If you can offer sponsorship, please contact Gill Ellis on gillianellis48@yahoo.co.uk or 07976 955905. Harlow Judo Club also caters for those with special needs – please contact the Club for more details. They are based in Foldcroft, Harlow, CM20 1SE. For training times, please visit www.harlowjudoclub.com. One Response to "Judo: Harlow Judo Club travel the country"
Well done Owen and team HJC. Great result and effort from you all.